MSE Creative Consulting Blog: "What Tornadoes? Hadn't Heard About That." The title of this posting is verbatim from an inquiry I received this morning. 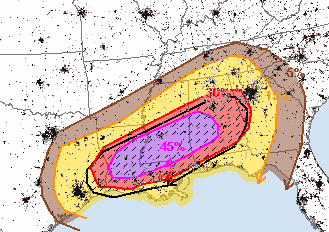 I'm very concerned that people in the South will be caught by surprise by the tornado potential. So, I'm asking if you have friends in the areas outlined below you give them a call. 5% is the significant threshold. The hatched area is where violent, long-track tornadoes may occur -- some of which will be after dark! This is a major threat. The tornado and damaging winds threat will move into the Carolinas on Wednesday.